January New Year's Retreat. Upcoming Trainings and Free Online Practice. It is also a perfect time to enjoy my Supple Psoas Series, Also FREE and recorded on Yoga Journals Webinar Series. Come back to this practice all season long to keep you grounded and more centered. As we move deeper into this season I have many offerings to share. Begin The New Year off with a deep Recalibration! I'll be back at Kripalu leading my Annual New Years Retreat with special Guests and dear friends - Composer and Bassist Garth Stevenson and Chantress Kristen Ambrosi. This has become my favorite way to usher in the new year and harmonize with the beauty of winter. Plan now, as this retreat will sell out. .
Ready to make BIG shifts in your practice or teaching? I have several upcoming trainings that help you grow exponentially. I'll be leading Restorative Yoga Teacher Training at Kripalu and Yoga Works in NYC, as well as my Annual Yoga Therapeutics Teacher Training at Yoga Works, NYC. Want to become more proficient in meeting your students individual healing needs? When you complete my 60 hours of Therapeutics and 40 hours of Restorative Modules you will earn a certificate for 100 hours of training specializing in Yoga Therapy. After a beautiful summer connecting with my family, I am super excited to be back in the classroom working with you. 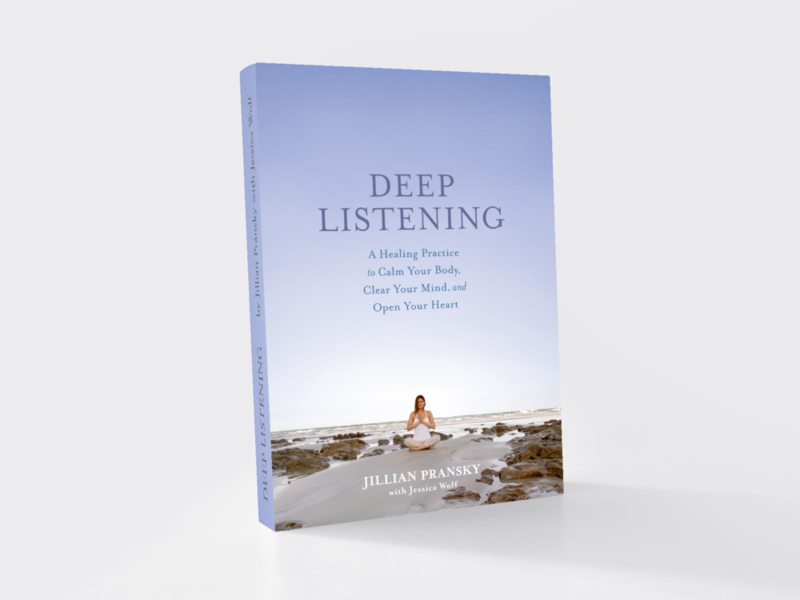 Please feel free to email me with any questions at jillian@jillianpransky.com. September launches us into new schedules, goals, and a long list of things to do. And while it can be exciting, this transitional season can also cause us to have a harder time feeling grounded and calm; we may agitate or stress more easily, become more anxious or 'spacey', experience less rejuvenating sleep, or deplete faster than normal. Rather than rushing to keep up, slowing down can be just what we need to reset our energy and embrace change in a balanced and healthy way. This simple practice of slow flow and minimally propped restoratives to help you feel more grounded, calm, rested, and replenished all month. We will finish with a simple Reset practice to use off the mat and in the day-to-day moments of your life. Please have a mat, two blocks, two yoga blankets (or pillows). Renowned composer and bass player Garth Stevenson offering live music during restoratives. And Chantress Kristen Ambrosi will sing us deep into our heart centers. Align with nature and savor winter’s gifts as you let go, and kindle your inner glow. In the cold months, the earth stops producing and replenishes its energy reserves. We, too, need to slow down, turn inward, and recharge. To help you harmonize with this natural cycle, our weekend will artfully integrate mindfulness with slow-flow vinyasa, restorative yoga, and deep relaxation. We will emphasis internal observation, rhythmic breathing, and fully supported rest. You discover the wisdom in the Chinese proverb, “Tension is who you think you should be. Relaxation is who you are.” And from this place, step into the New Year more connected to your deeper inner voice and authentic self. A 27 hour, comprehensive training, integrating my Level 1 and Level 2 programs. Full Track Restorative Teacher Training. Program includes yogic and ayurvedic principles and practices for working with the most common side effects of stress, illness, and injury: insomnia, digestive issues, trauma, anxiety, and depression. As well as structural limitations and chronic pain. You will gain knowledge, confidence, and a wide array of tools to adapt yoga and create deeply healing sessions for individuals with a variety of conditions. Guest Specialists will offer expert presentations in trauma-informed yoga, yoga for veterans, back injury and care, muscle release ball work, and so much more. You will have the unique opportunity to apply your skills during this program through teaching an in-class private to a student challenged by the very conditions we are studying. You may register for full the 60 Hour program or a single 30 Hour Module. Please note that this program does not include curriculum from my Restorative Yoga Teacher Training. Earn a 100 Hour Specialty Certificate in therapeutic applications of yoga when you complete both my 60 Hour Yoga Therapeutics program and 40 Hours of Restorative Yoga Training. This program is On Demand and you can enroll any time. This four-week program offers a deep dive into eight essential poses as you learn to elicit a relaxation response. Each week I weave fundamental themes of a restorative practice—grounding, making space, listening, and rejuvenation—into the coursework so you can begin naturally integrating these principles on the mat. You’ll focus on simple prop setups to help encourage deep mind-body release and healing. Whether you are an avid practitioner, are new to restorative, or want to teach it effectively, this course will give you the tools to build a nourishing restorative practice. Note: This course counts as 30 Hours of Yoga Alliance non-contact hours. This program is perfect for students and teachers of all levels. And it is the PERFECT compliment to the In person programs!